Welcome to the 2017 Southeast Regional Conference for the National Association of Graduate-Professional Students (NAGPS)! 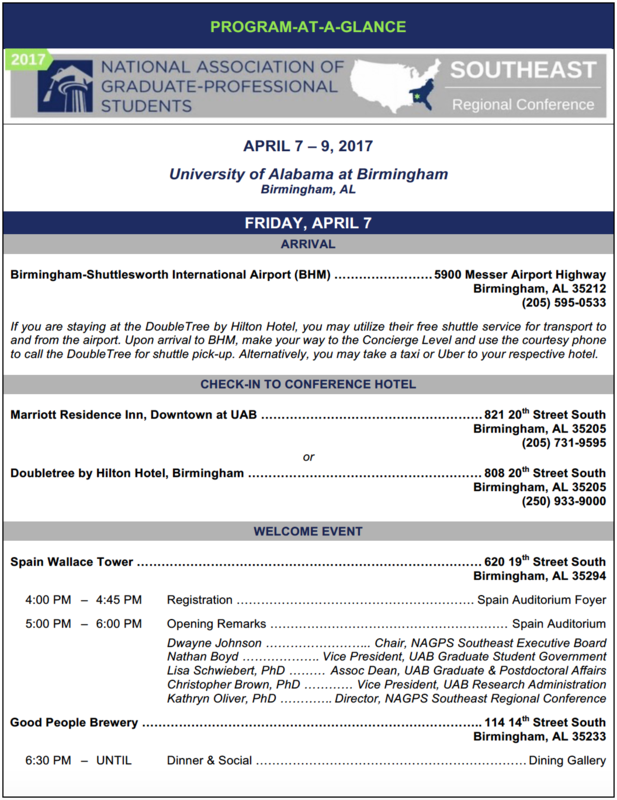 This event is scheduled for April 7-9, 2017 at the University of Alabama at Birmingham (UAB), Birmingham, AL, and is hosted by the Graduate Student Government (GSG) at UAB. This is a great opportunity to meet and network with fellow graduate student leaders from the Southeast region – Alabama, District of Columbia, Florida, Georgia, Maryland, North Carolina, Puerto Rico, South Carolina, Tennessee, U. S. Virgin Islands, Virginia. We are diligently organizing a memorable conference experience for you, with this year’s theme being “Modernizing Graduate Education.” This is a fantastic opportunity to meet and network with fellow graduate student leaders from across the Southeast Region – Alabama, District of Columbia, Florida, Georgia, Maryland, North Carolina, Puerto Rico, South Carolina, Tennessee, U.S. Virgin Islands, and Virginia.. So, REGISTER NOW and submit an abstract for student presentations. Please don’t hesitate to ask questions to the SE regional chair Dwayne Johnson (serc@nagps.org) and/or the conference director Kathryn Oliver (seconference@nagps.org). We are looking forward to meet with you! 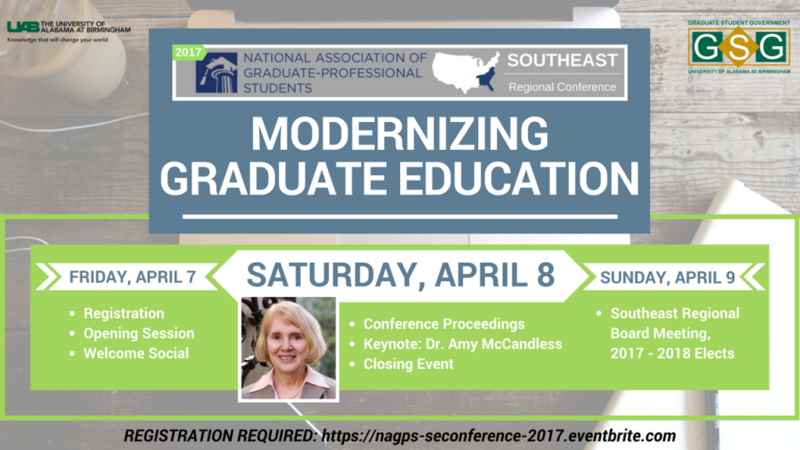 The NAGPS Southeast Executive Board is proud to present Dr. Amy McCandless, 2016-2017 President of the Conference of Southern Graduate Schools (CSGS), as this year’s keynote speaker. Dr. McCandless received her A.B. in History from Sweet Briar College in Virginia, her M.B.A. in Personnel from the University of South Carolina, and her M.A. and Ph.D. in Modern British Social History from the University of Wisconsin. She began working at the College of Charleston as one of the editors of South Atlantic Urban Studies in 1976 and joined the History Department in 1981. From January 2001 to June 2006, she served as Associate Provost. In July 2006, she became Interim Dean of the Graduate School and Associate Provost for Research. In March 2008, Dr. McCandless was appointed Dean of the Graduate School, and served in that role until her retirement in July 2016. During her tenure as Graduate School Dean, Dr. McCandless worked to increase funding for assistantships and research, helped establish the Graduate Student Association and the Graduate School Advisory Board, implemented responsible research training conduct protocols, and introduced an annual graduate student poster session, as well as the 3MT® Competition (three-minute thesis). It is evident that her impact on the College of Charleston campus, CSGS, and her profession have been and will continue to be far-reaching. We are thrilled to hear her thoughts on best practices for “Modernizing Graduate Education” in 2017, and we sincerely hope to see you there! – Click here to make your reservation. The discount is already applied – no group code required. – Should you experience any issues, please call the hotel directly at (205) 731-9595. – Click here to make your reservation. 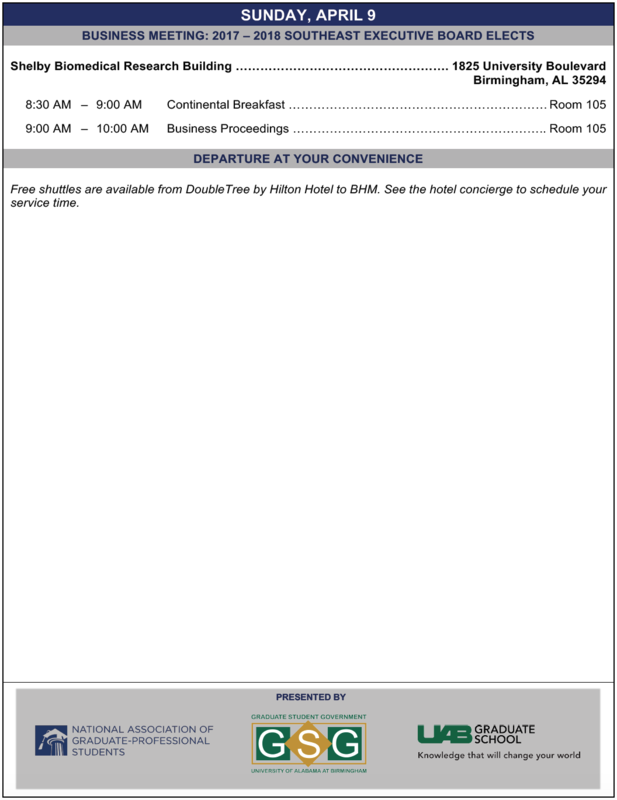 Insert the Special Rate Group Code: UAB. – Should you experience any issues, please call the hotel directly at (205) 933-9000. 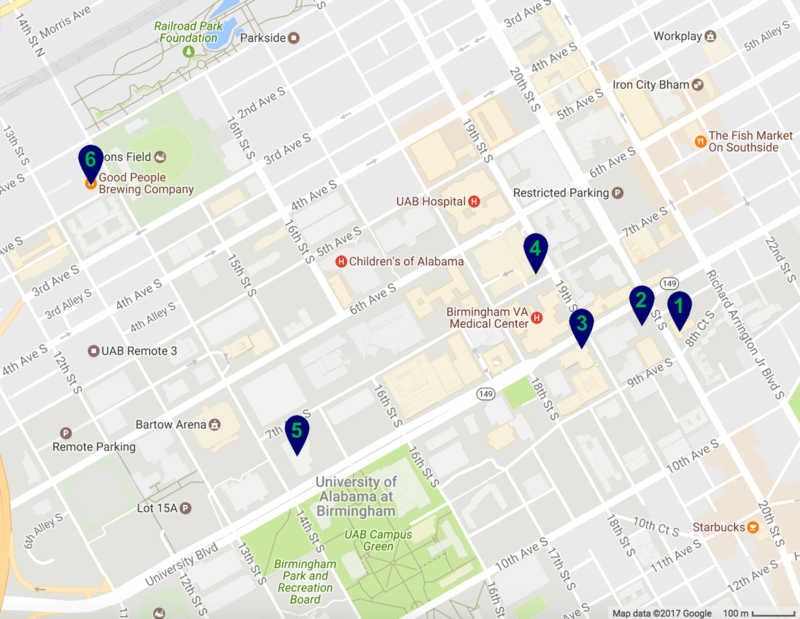 If you are flying into Birmingham, you will arrive at the Birmingham-Shuttlesworth International Aiport (BHM), which is located ~15 minutes from UAB. You may take a rental car, taxi, or Uber ride from the airport to your hotel. – Merge onto I-65 S.
– Take exit 259B onto 4th Avenue South; this is a one-way exit that curves to the left. – Immediately turn right onto 11 Street South. Continue 0.3 miles. – Turn left onto University Boulevard (8th Avenue South). 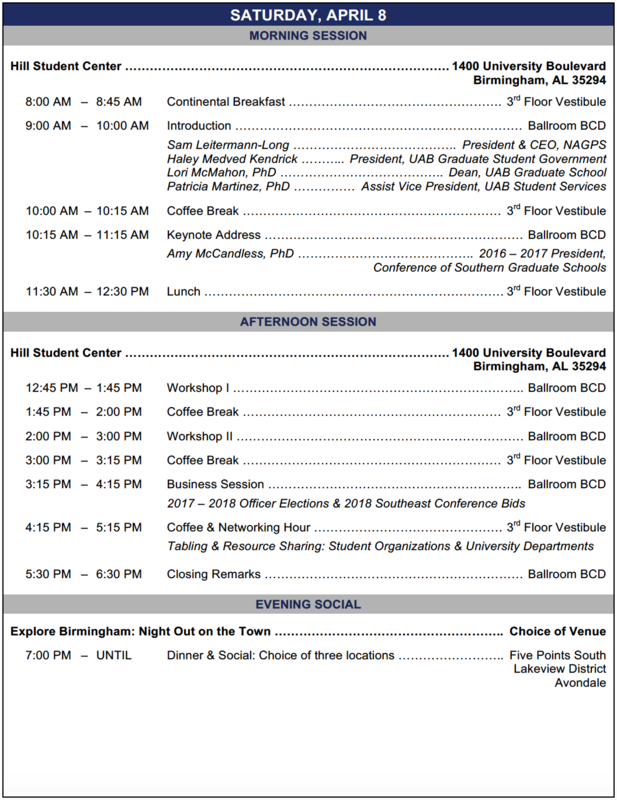 – The Conference Venue (UAB Hill Student Center) is on the corner of 14th Street South and University Boulevard. The Conference hotels are on the corner of 20th Street South and University Boulevard. – Merge onto I-59 S.
– After I-59 S merges with I-20 W, continue for 4.2 miles. – Take exit 126A to merge onto US Hwy 280 East (Hwy 31 South). Continue 1.7 miles. – Take the University Boulevard exit. – Turn right onto University Boulevard (8th Avenue South). – The Conference hotels are on the corner of 20th Street South and University Boulevard. The Conference Venue (UAB Hill Student Center) is on the corner of 14th Street South and University Boulevard. – Merge onto I-20 W.
– Keep left when I-20 W merges with I-59 S. Continue on I-20 W / I-59 S for 4.2 miles. – Merge onto US Hwy 280 W.
– Keep right when US Hwy 280 W merges with Hwy 31 N. Continue 1.5 miles. – Merge onto I-65 N.
– Take exit 259 for University Boulevard; this is a one-way exit that curves to the right. – Continue straight onto University Boulevard (8th Avenue South). – Merge onto I-20 E / I-59 N.
– Take exit 124A onto I-65 S. Continue 1.5 miles. All official conference proceedings will be hosted within walking distance of the venue, hotels, and several local restaurants and bars. Should you wish to get out and explore the city, you will need a rental car, taxi, or Uber. – If you are an NAGPS member, you may contact Hertz Rental Car for special promotional pricing that is included in your membership benefits package. In Birmingham, the average cost of a rental car is $20-$40 per day. – If you would like to estimate a potential taxi fare in Birmingham, please click here. – Should you wish to estimate the cost of an Uber fare in Birmingham, please click here. If you are interested in hosting the 2018 Southeast Regional Conference, you must submit a letter of intent to the NAGPS Executive Committee (excomm@nagps.org) AND Regional Chair (serc@nagps.org) before the regional conference, April 1, 2017. This letter shall provide two important elements: (1) approval of the graduate-professional student organization (GPSO) to host the regional conference; this can include approval from your GPSO, Dean, or Administrator, and (2) a named Director of Regional Conference to coordinate planning and volunteers of the regional conference (the Director must be a member of the host organization).